I arrived at Hokkaido at about noon on a Thursday. The place is divided into two sections; one seating about 40, where I ate, and another larger one that didn’t appear to be in use for lunch. It is quite nicely appointed inside, very clean, and spacious, and I was shown to a table immediately. The staff who served me (and there seemed to be quite a large number of young ladies on duty for such a small crowd) were all pleasant and friendly but the English language skills of all I dealt with were a bit rudimentary. They were able to manage the basics necessary for ordering, but anything a bit more complex became difficult. 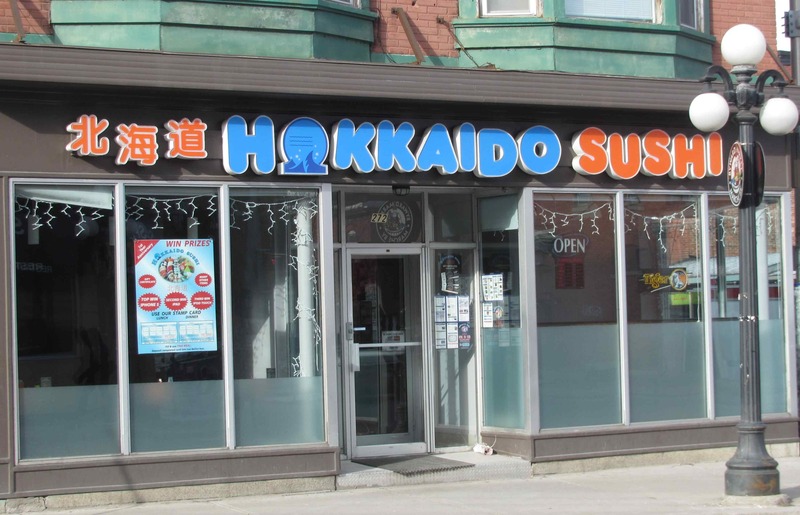 Hokkaido Sushi is primarily an ‘all-you-can-eat’ type of establishment. At $13.99 per adult at lunch on Thursday, the price is very reasonable and I am certain I could get my money’s worth at those prices if was minded to. However, I really only wanted to sample a couple of small appetizer size dishes and I was a little dismayed to see that a good number of the items that appealed to me were not available for lunch… at least, not on the ‘All-you-can-eat’ menu I was given. It was not until I was almost finished that it became apparent to me that there is, in fact, a regular a la carte type menu available and, presumably (although I didn’t get to see it), some of the items I wanted would have been available for a fixed, individual price. I had a very circular and confusing discussion about this with a couple of the staff and was ultimately able only to learn that they had simply assumed I wanted the ‘all-you-can-eat’ deal. In any event, it was a bit annoying not to have been given the option when I was seated. On a somewhat related note, I was struck by the fact that all the dishes I ended up ordering were not plated or served with quite the same visual attention to presentation as is usual in Japanese restaurants. It only occurred to me a little late that the kitchen staff were set up for serving larger orders rather than the small individual samples I wanted and thus had to improvise with the plates they had on hand. 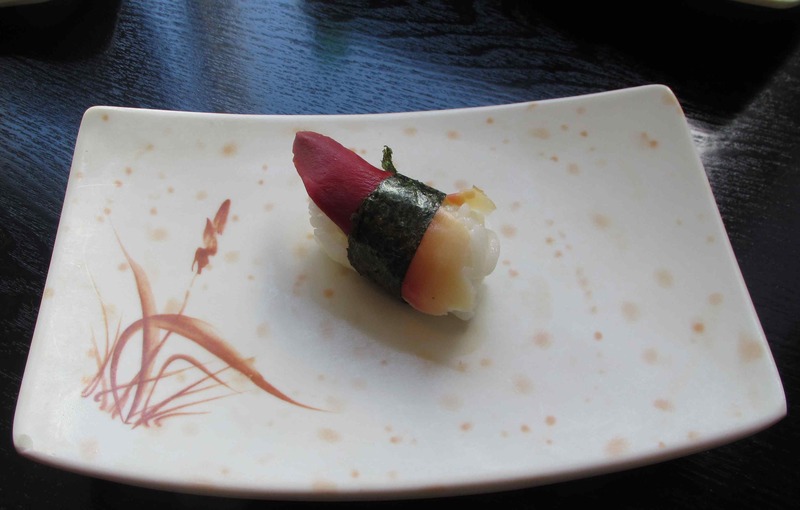 Surf Clam Sushi – Aside from the unfortunate plating, this wasn’t too bad. The sushi rice was good and the clam, while just slightly dried out, was fresh and tasty. It was adequate, if not outstanding and I gave it a 3 out of 5. 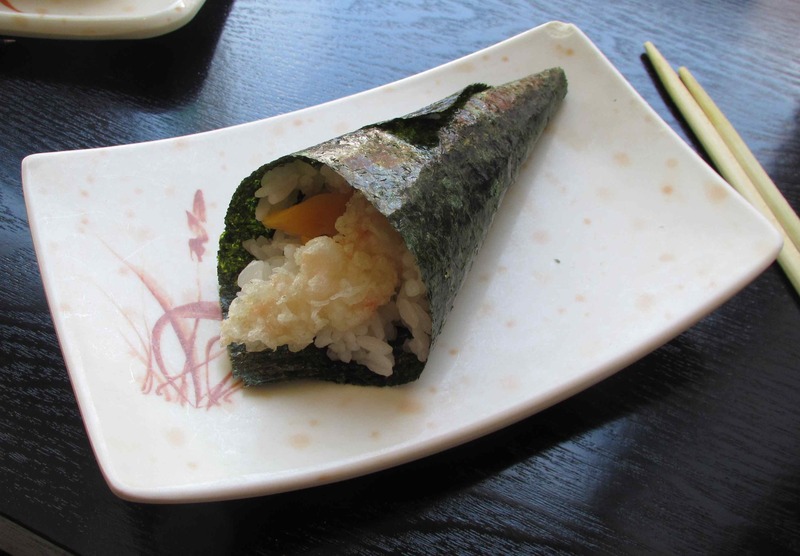 Mango and Tempura Shrimp Hand Roll – This was not the prettiest example of temaki sushi I have ever had it but was extremely tasty. The nori had that just roasted taste and was delightfully crispy, while the shrimp tempura was nicely balanced by the tart sweetness of the mango and neither was dominated by too much rice. This was actually one of the nicest sushi preparations I have ever eaten and I happily give it a 5 out of 5. 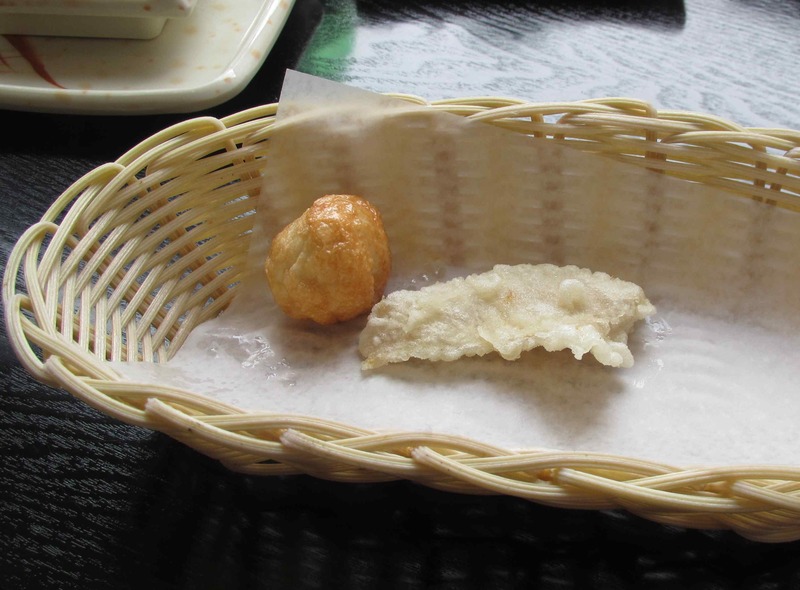 Snapper Tempura and Squid Ball – This is a good example of the plating issue I mentioned above. It was a bit visually unappealing but, given the circumstances, it would be unfair to subtract points because of it. The snapper was not terribly good as the fish was not especially fresh and the tempura was too oily and not all that crisp. I could only give it a rating of 1 out of 5. The squid ball was not strips of squid flesh in a light tempura batter as I rather expected, but was instead, thick chunks in a heavier coating. The squid itself was very fresh and tasty but I found that the thick doughiness of the batter dominated it too much. I gave it a 2 out of 5. 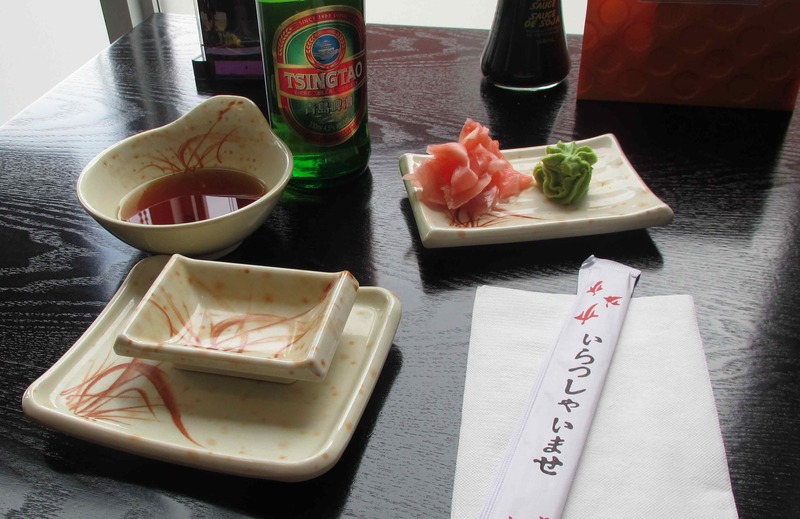 This was certainly not the best experience I have had in a Japanese restaurant but the fault lay more with my misplaced expectations than anything done by the staff. The service, linguistic difficulty excepted, was very good and one of the items I tried was outstanding. I expect that this place is deservedly popular with quite a large number of patrons and, in the spirit of fairness, I rate it at a 4 out of 5. 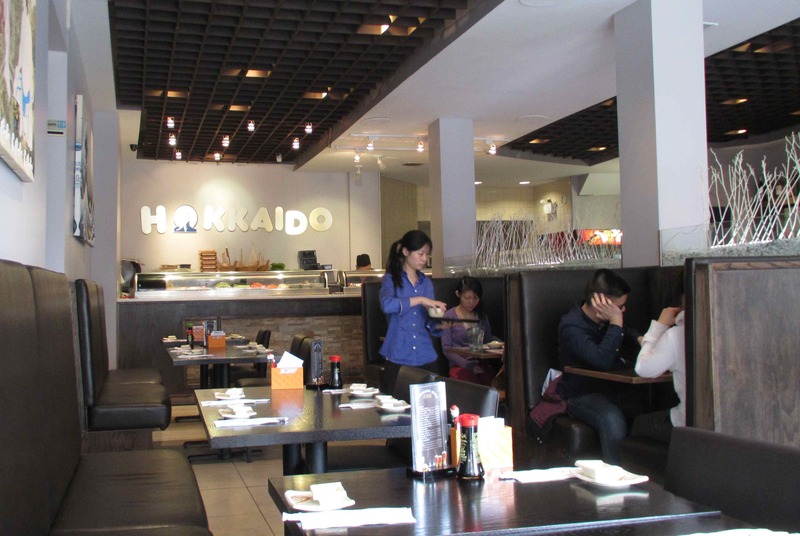 Your article Review: Hokkaido Sushi | Sybaritica write very well, thank you share!